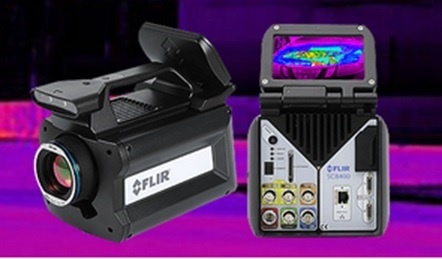 FLIR Systems X6000sc and X8000sc series thermal imaging cameras with Lock-In, Transient, and Pulse capabilities offer unmatched capabilities to perform advanced inspections such as Non-Destructive Testing (NDT) or stress mapping that resolve temperature differences as low as 1 mK. NDT is a standard method used to evaluate the properties of a material, component or, system without causing damage. Thermal imaging cameras offer the ability to detect internal defects through target excitation and the observation of thermal differences on a target's surface. In addition, thermal imaging cameras provide a valuable tool for detecting defects and points of failure in composites, solar cells, bridges, and electronics as well as enabling thermal mapping of stress when performing materials testing. The FLIR X8000sc/X6000sc Series thermal imaging cameras are designed to provide the best thermal measurement performance. Designed for scientists, engineers and researchers they can provide high resolution thermal images up to 1280 x 1024 pixels (FLIR X8400sc) that will enable you the see the smallest of details and assure excellent measurement accuracy. These advanced thermal cameras detect temperature differences smaller than 25mK (18mK typically). With FLIR Systems proprietary “lock-in” process temperature differences as small as 1mK will become clearly visible. The cameras automatically adjust their temperature range to best fit the thermal scene. Designed to unlock the secrets of almost any application, a FLIR X8400sc camera can measure temperatures up to 3,000º C with an accuracy of +/- 1ºC or +/- 1% or faint thermal emissions from areas as small as 3 x3 microns. FLIR X8000sc and X6000sc Series cameras work seamlessly together with FLIR ResearchIR Max software enabling intuitive viewing, recording and advanced processing of the thermal data provided by the camera. Each camera comes standard with this especially for R&D applications developed software.